Conveniently situated in the heart of the City of London, our new property for sale in the Atlas Building development promises to deliver a premium living space in what is bound to become a striking and highly desirable feature of London’s sprawling skyline. The imposing yet understated design by acclaimed architect firm MAKE is intended to install the dramatically designed building mindfully into its surroundings. We at AW Childs Estate Agents – specialists in Barbican, Clerkenwell and Islington are proud to bring to the market an exclusive spacious two bedroom apartment in the soon to be completed development. The property itself is remarkably spacious – with two well proportioned bedrooms – one of which (master bedroom) boasts a stunning ensuite – the space will be comfortably big enough to house a small family or professional couple. Featuring a high-spec open plan kitchen/living room that boasts integrated Siemens appliances, the property’s living space will be a joy to behold – designed to an amazingly high standard, the living space also features a private balcony that promises a dramatic and breathtaking view of the cityscape that surrounds this remarkable building. The high standard of finish is continued into the main bathroom that has been completed in full-body tiles, and features chrome fixtures and fittings to ensure a modern and contemporary look. The bathroom does not only look stunning, the baths and showers of the property have thermostatic valves which help to ensure a consistently perfect temperature bathing experience every time. The bathroom is just one of the stunning rooms that this incredible property offers. The bedrooms continue the modern look and also feature helpful design ideas such as custom designed built-in wardrobes that even have internal lights to help you to pick the right outfit every time. The master bedroom also has a superb ensuite bathroom, and the room continues the contemporary and high-spec look of the property with luxury broadloom carpet fitted in both bedrooms. All in all this is an extremely high-specification property that features beautiful design and excellent features all with the stunning backdrop of the City of London available from your own private balcony. It is the ideal home for those who wish to live in the city, but also want to live in an amazing space to appreciate it. As you can imagine, a home in this prime area of the city is going to be surrounded by amazing amenities – you are not wrong. Located between Shoreditch, Islington and Clerkenwell, the property is ideally located for London’s transport system. It is also right on the doorstep of the City of London – making it an ideal property for city workers. As well as being surrounded by excellent transport links, the property is also surrounded by some of London’s most interesting and culturally significant areas – there is much exploring to be done in the local area. There is also a screening room and even retail space for a unique experience all inside the very building that you live in – you may never need to leave! 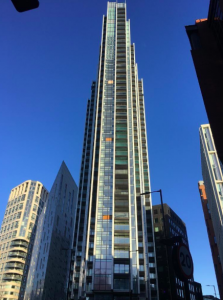 With 80% of the apartments already sold, it is clear that the Atlas building is going to quickly become one of London’s most sought after addresses. So to find out more, or to register your interest in this unique opportunity, get in touch today with AW Childs Estate Agents on 0203 693 9444 or email us [email protected] and speak to a member of our team about this once in a lifetime opportunity to own one of London’s most unique and sought after addresses.